Workout crazes come and go. Most have little or no scientific justification, but many bring results anyway. The question is, do the results reflect your efforts, and do the programs help you reach your goals? Muscles are highly adaptable, so almost any program that stresses the muscles will cause some improvements in muscle tone, strength, and shape. Often, hard work in the health club does not produce enough results to justify the effort. High-speed training brings rapid results, and we have the science to prove it. The Optimum Performance Workout uses a combination of high-stress weight training exercises to build strength and explosive movements, to build power. It also turns on hormone systems that trigger muscle protein synthesis and promote fat loss instead of fat storage. An effective weight-training program should create high levels of muscle tension. High speed, explosive training overloads the fibers and creates more muscle tension than any other form of training, yet few people incorporate it into their exercise programs. High-speed training can cause injury if you progress too rapidly. Start off with light weights and progress slowly. Also, incorporate all the elements of a healthy lifestyle that promote physical fitness, including healthy diet, stress management, adequate sleep, and a sensible exercise program that doesn’t promote overtraining. High-speed explosive training is a scientific breakthrough that will bring rapid results and help you achieve optimum performance. Muscle is one of the most metabolically active tissues in the body. The more muscle you have, the more calories you use during the day and night. Muscle is also important for using calories during and after exercise. Building muscle mass is an important way to increase metabolism, burn more calories, and lose fat. Intense weight training builds muscle and cuts fat. Since muscle is more dense than fat, your body looks toned and buff. Lifting weights will increase muscle mass and burn more calories. Don’t be a wimp. 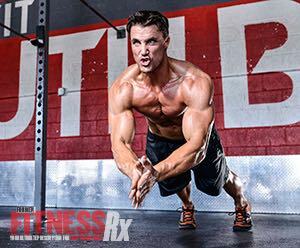 Train intensely and explosively during each set and repetition. This will build metabolically-active muscles that will help you burn more calories and fat. Hard work will bring you closer to your goal. The training program includes high-intensity weight training, explosive exercises, high-intensity interval training, and aerobics. The explosive weight-training program includes traditional exercises, such as squats and bench presses, each followed immediately by high-speed power exercises. East German and Soviet coaches developed the technique of pairing muscle overload exercises with unloaded explosive exercises (e.g., plyo box jumps, Marine push-ups, rope skipping) in the 1970s. Do each pair of exercises without rest; rest two minutes; do the next pair of exercises, etc. Do this workout two times per week. On two other days per week, do a high-intensity interval training workout. We have described a sample program and included exercise instructions. Warm up for at least two minutes before doing any of these workouts. For the weight training exercises, choose a weight that you can lift for 6-8 reps with some difficulty. 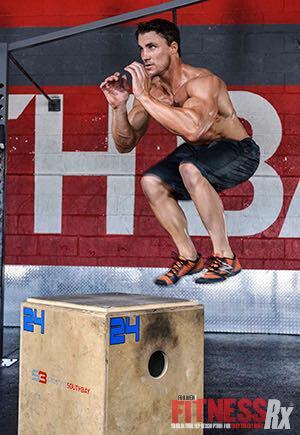 Do 6 reps for each exercise as fast and explosively as possible, followed immediately by the plyometric or speed exercises, also done at maximum speed. For example, the first set of exercises involves heavy squats, followed immediately by maximum-intensity rope skipping for 1 minute. Rest for 2 minutes, then do the next pair of exercises. Perform each exercise rapidly and explosively, while maintaining good form and posture. Do the Optimum Performance Workout 2 times per week (e.g., Monday and Friday). Exercises (Sets X Repetitions): Do the following circuit 1-3 times.